Weird Wonderful Web: Two similar but very different shark tales! 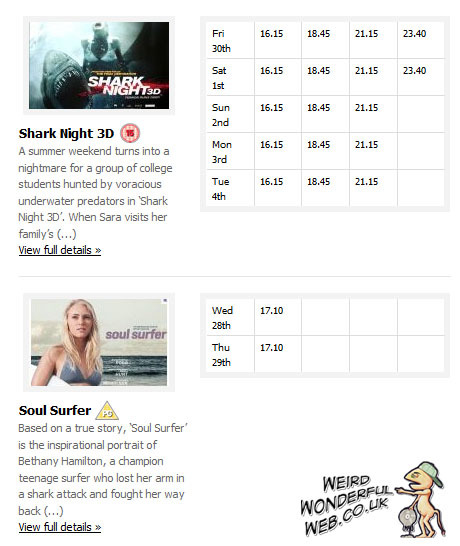 This cinema listing shows two shark themed stories but from very different angles. The shark films listed in situ. This here is a recent cinema listing I came across. Two shark films are out at the moment, but the stories are told from VERY different angles. Both include sharks and teenagers but read the brief descriptions under each. Now I'm not sure if this is an unfortunate coincidence or, the person responsible for listing the latest films showing has placed these side-by-side for amusement. I like to think it was on purpose just to see if anyone is taking notice. As you can see they are both about sharks of course but that's not why they are together. I believe it's just a coincidental case while listing them, rather predictably, in alphabetical order as you can see from the longer pic to your right. Shark Night 3D and Soul Surfer are sandwiched between Rise of the Planet of the Apes and Speedy Singhs. But just imagine if you were the person whose heroic survival story was the basis for the film Soul Surfer and when attending the premier you see Shark Night 3D next to your poster!